This is a recipe for simple bircher muesli. This basic recipe can work as a base for you to add your own toppings of choice. In a medium bowl, combine the jumbo rolled oats and apple juice. Cover, and leave in the refrigerator overnight. Serve with dried fruits, seeds, nuts, yoghurt, grated apples, fruit compote, jam, or anything else desired. The soaked oats will keep for 2 days in the refrigerator. 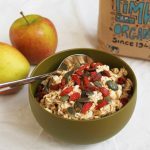 Get this recipe for Simple Bircher Muesli at https://www.theworktop.com/breakfast-brunch-recipes/bircher-muesli-recipe/.